Websearch.fixsearch.info is a search engine that can replace your home page and default search provider within Internet Explorer, Google Chrome, and Mozilla Firefox. These changes are made by a so-called browser hijacker, which is distributed alongside free programs, such as browser add-ons, media players, system optimization programs, and other software programs. The odds are that you will find the installer of this browser hijacker when browsing insecure website or clicking on an advertisement encouraging you to download a new program or update your Java player or Internet browser. It is highly advisable to ignore such recommendations and keep the computer protected because there are many browser hijackers identical to this one, which we call websearch.fixsearch.info. If you have changed the settings unintentionally, you should remove websearch.fixsearch.info from the computer as soon as you can. Websearch.fixsearch.info belongs to a group of browser hijackers that promote identical search engine, which include websearch.oversearch.info, websearch.searchiseasy.info, websearch.pur-esult.info, and many other search providers. 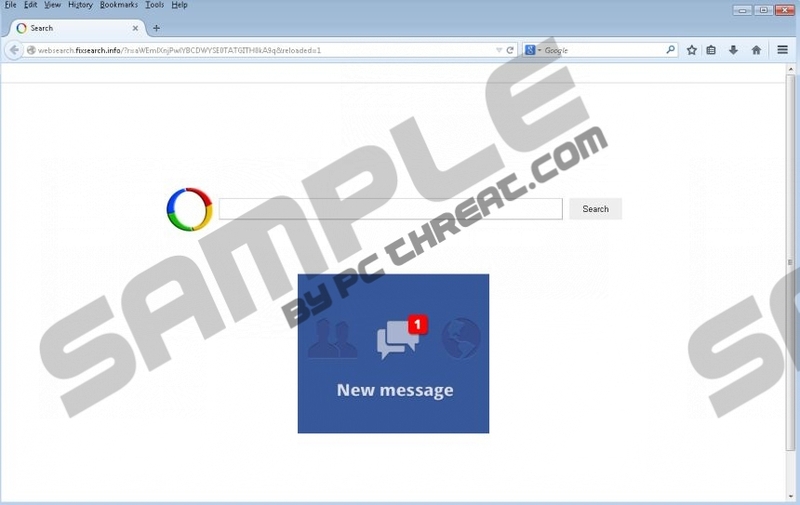 The websearch.fixsearch.info browser hijacker installs browser extensions to Internet Explorer, Google Chrome, and Mozilla Firefox. The names of the extensions vary; you may find MySearch 2.1, SearcNewTab or SNT. Moreover, each of the names may contain some additional, unnecessary letters. We recommend that you remove websearch.fixsearch.info from the computer as soon as you can because websearch.fixsearch.info is an advertising-supported search engine. Every time you open your hijacked browser, you are provided with some startup advertisement. A new advertisement is generated every time you load the page, and you should keep in mind that those advertisements are sent from certain servers hosting advertisements. Websearch.fixsearch.info does not endorse those advertisements and has no control over their content and the activities of the websites related to those websites. You use the search engine and interact with its advertisements at your own risk. Bear in mind that websearch.fixsearch.info can be used by cyber crooks, and you cannot know when you will be directed to some deceptive websites. Hence, you should not hesitate to remove websearch.fixsearch.info from the Internet browsers. Below you will find instructions that should help you eliminate websearch.fixsearch.info from the computer but recommend that you rely on a reputable security tool. If you do not have any antimalware program, it is high time you implemented one because your unprotected computer is susceptible to various threats, including Trojan horses, browser hijackers, adware programs, rootkits, ransomware infections, and many other malicious programs. We advise you to use SpyHunter because this security program has successfully dealt with Websearch browser hijackers and can easily remove websearch.fixsearch.info from your browsers. If you have any questions concerning the search engine or the removal process, feel free to leave a comment below. Select the check box and click Reset. Make sure the browser contains no malicious extensions. If you want to be sure that the computer is malware-free, you should install a reputable scanner. Click the button below to download our recommended security tool. Quick & tested solution for websearch.fixsearch.info removal.